Posted on November 1, 2012 by mimijk •	This entry was posted in discretion, friendship, inspiration, life lessons, love, mindfulness and tagged communication, politics, seasons. Bookmark the permalink. Beautifully written. As the mantle passes from the warmer days of wearing shorts, to cooler and grayer days with a sweatshirt keeping us warm, you poeticaly make it all seem so okay. And for your ability to poke Ann Coulter in the eye while you bend your words gently in the breeze, you rock babe. Thanks sweetie..I just can’t shake how tired this vitriol makes me, how heavy the burden for those who’s conscience can’t absorb absolute, strident assaults – like the wind assaulted the trees.. So beautiful. 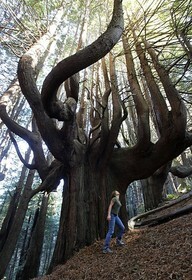 I love how you despair over the burden trees seem to carry. It is poetic and sorrowful and to then tie that into us humans and our unthinking unkind ways – brought tears to my eyes. Thank you..somehow it all seemed interconnected to me today..And I can’t abide cruelty in the name of free speech, the mantle of self-righteousness in lieu of understanding. And somehow the exhaustion of the trees felt completely understandable to me. Then, lean on me for a while. It’s okay to be tired, it takes courage to admit to it. I am here – always. Ahhh, honey, you’re so wise, and so, so right. I am in total agreement with your comments. Probably because I am so close to the situation, being the President and Governor Christie were 15 minutes from my town. And regardless of my Politics, I was so grateful they were both so united and wanted to help my communitites who so desperately need it. I was proud of the fact they put politics aside to help us out. At that point, regardless of what the pundits said, they were wrong to me. Because I know the President and Governor Christie were doing what is best for all of us. Hoping that your situation is improving! I lived in Princeton for 10 years and loved it, so have a soft spot in my heart for many places in New Jersey. Too much sadness and loss over the last week to be engaging in partisan bickering and potshots, that’s what I’m thinking….take good care…. As with all of your posts, Mimi, this one is truly amazing—perhaps my favorite! Simply beautiful Mimi, the trees my way are taking off their clothes preparing for a nice winter rest. Enjoy the rest of this beautiful day. Thank you Tina – I hope the rest of your day is equally as wonderful.. I was out with my mother today and we were discussing all the large trees that were scattered around due to Sandy. My mother said “those tree are just like people, the older we get the more frail we are even though we are larger.” Little children can fall and brush themselves off, if I fall I’m done.” “We’re all living things Lisa” You never now what you’ll learn on the way to the super market. All I can say about Ann is….she leaves me silent. I love that your mom is still with you and imparting wisdom in such a magnificent way..!! She sounds pretty darn special…like her child. As to Ann – me too. Wonderful post, Mimi. Love the metaphor of trees needing rest. We all need rest- to heal, to find our roots and to welcome new growth when the sun lights us again. Well done! Far removed from your ‘Sandy’ storm here, but have survived others in the past, so understand the mixed emotions of seeing both the majesty and the devastation at the same time. Glad that you are looking forward to a new season. 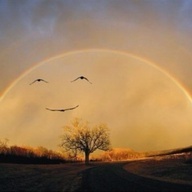 By the way, did you see the smiley face made by the birds under the rainbow in the photo you posted? Seems as if it a message……….. I most certainly did!! That’s why I posted it – the idea that despite all, there are still reasons to smile..
What a beautiful post. Loved your connectedness with the trees – they are so precious, and for the most part,so un-appreciated . And I so agreed with your questions… is it honest, true, kind? I brought my children up asking them if what they are done was kind, instead of castigating them for whatever they’d done. The world needs kindness so much… maybe that will be one of the things your terrible storm has and will bring out. We’ve been with you in our thoughts this side of the world. Thank you Valerie – interestingly, I used to pose the same question to my sons…We are ok, my sister in NY has been without power since the storm and friends in NY and NJ and northern Connecticut have fared worse. And then there are others who have truly sustained the worst.. When mother nature has a tantrum us humans can be so strong and amazing in how we deal with her tantrum, Sandy was a massive tantrum and people have shown how amazing they are just dealing and surviving her……………..
That’s certainly true Joanne – people come together in times of crisis in many exemplary ways..
Only a few days left and the election season will be over, you must all be sick and tired of it all by now. Mother Nature cast her vote, and funnily enough made an impression on everyone. Climate change is back on the political agenda. And I for one am very happy that it is back on the agenda Alex – regardless of what some naysayers insist. Every time I visit your blog I feel like I’ve come home to a kind and loving family. I miss you when I’m gone and wish I could get WordPress to have them send your posts to me when you publish them as I’ve repeatedly requested via clicking on your “follow” button.